Two Million Piece Mailing Completed in 5 days. Adopt a Dog or Cat – Free! Talon Performs Two Million Piece Mailing In Five Days. 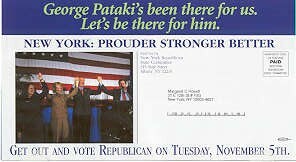 Talk about rush jobs: Talon was chosen to address, sort, and mail over two million pieces of mail for New York State Governor George Pataki. 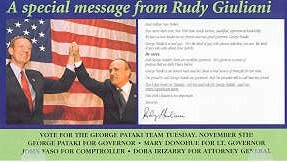 Governor Pataki is running for re-election. The mailing was scheduled to be produced and mailed over the last five days of October. Republican political consultants determined that this would be the ideal time to send the mailing so voters would receive the piece several days before Election Day. Talon with only a few days notice was able to coordinate the project. By stretching our two production shifts into three shifts we were able to ensure that the tight deadline would be met. 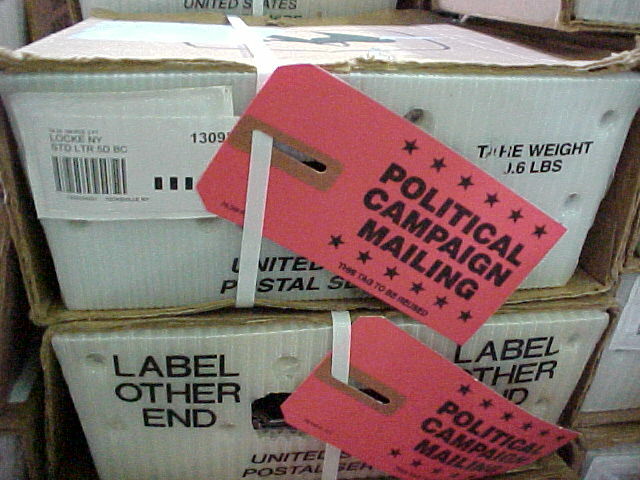 Political tags were attached to instruct postal workers to process and deliver the mail immediately. We are happy to report that the job went smoothly and was mailed on time as promised! Direct mail is one of the very best ways to get new customers. There are times when direct mail works and nothing else does. It can, however, be quite frustrating. Have you ever done a mailing that you felt would produce lots and lots of leads only to be disappointed with negative results? That's happened to just about everyone who ever put a stamp or meter imprint on an envelope and sent it to a name on a list. So what can you do to improve your chances of direct marketing success? Being a professional in direct mail, I have learned what does and what does not work. I would like to share some of those discoveries with you. 1. Use a good mailing list. Every one who sells lists says they have the best list. What most people have to sell, however, are simply names and addresses and sometimes phone numbers. While most any list of names can be useful, all too often most lists are not good. Many times the names are out-dated. People have moved. If you rent a business list, many businesses are in fact out of business or also moved. They have new managers or owners. Always ask the list broker how old the list is. Let's say you use the telephone book as a source. (Not something I would advise.) By the time the directory is actually printed the addresses in it are usually five or six months old already! On average, that means that 7% to 8% of the names are already out-dated. So use reputable brokers. And try to really target your list. If, for example, your best customers are males with an income of $50,000 to $75,000 living in the western United States, get a list of just that type of prospect. Why waste your money on a good list with the wrong type of names? If your prospects are opportunity seekers, which is the case for most people reading this article, make sure your list has the names of people searching for a moneymaking opportunity. Remember that your mailing is ONLY as good as your names. A great sales letter sent to the wrong names IS NOT going to pull leads for you. Not even a professional like myself can make that happen! 2. Do a test mailing before you do a big mailing that may fail. If you have a list of 10,000 names DO NOT MAIL THEM ALL AT ONCE. Oh it is exciting to think of the returns you could get. But it's not so exciting to think of the flop it could be. Test drop 100 to 600 names over a period of several weeks. 3. ALWAYS put a business reply card in with your sales letter. This will greatly increase your response. Even if you want people to call you, include a reply device. Face it, people are lazy. Make it easy for them to respond. Don't give them too many choices. But do have them provide you with their current name, address and phone number; the best time to call and any other information you need for your particular product, service or opportunity. The business reply card should "sell" for you if all the prospect saw was the card --- if there was no letter, no brochure. It is a critical element. Most people don’t realize that! So don't make the mistake of thinking a BRC is a simple form --- that one size fits all. That's simply not true. The business reply card or faxback is a necessary part of the direct mail package. You want to make it easy for the prospect to check a box or two, fill out a line or two, and put it in the mail or fax it back to you. 4. ALWAYS put your phone number on the business reply card AND in several places in the letter. Some people like to use telephones. They would much rather pick up the phone and call than send in a card or use the fax or anything else. They want action and they want it now. These are my favorite people. They'll be yours too. Make it easy for them to call you. Provide a toll-free number if you can. Do so especially if you take orders by phone as opposed to offering information. 5. Let the prospects know exactly what you want them to do. Do you want them to ask for more information? Do you want them to order now? What do you want from them? With some products, one mailing is enough. What you want is an order. With other products and services and opportunities you want to offer more information. But let the prospect know what he or she must do to reap the benefits of your offer. 6. Know how many mailings your product or service requires before a deal can be struck. 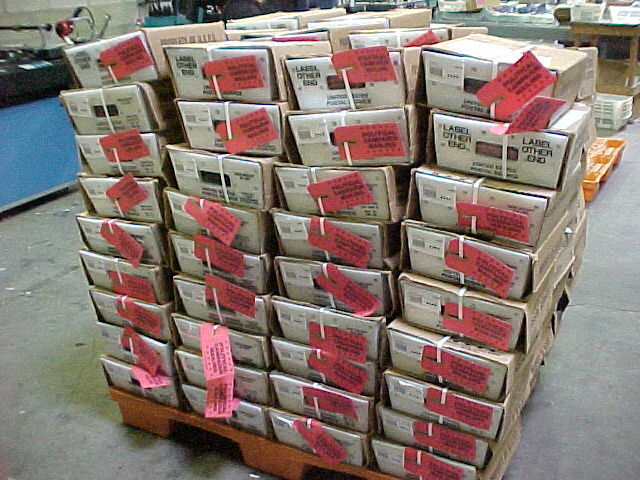 If you have a mail-order business, you probably want an order with your first mailing. If, however, you sell a service, as I do, you may simply want to interest the prospects enough to contact you for detailed information. Therefore, the first mailing should be short and simple, yet very seductive. The second mailing, on the other hand, should be detailed and personalized. It should prepare the prospect to order or to call. Finally, you should tell the prospect to call you and order your services, product or information or fill out an order form. The one-stage mailing should be detailed. You must sell and sell hard in a one-stage mailing. You must provide the order form and all of the details. But in the three-stage mailing you take it a step at a time. First you present your product or service or opportunity... you entice and inform and cause interest. You ask the prospect to request more information. Second, you offer detailed and personalized information based on the facts the prospect has provided you. You ask the prospect to contact you to finalize the deal or get even more information based on his or her personal needs. Finally, you cut the deal. Hold some vital information until this point and make it available ONLY in the third stage. Some Odds and Ends of Direct Mail: It's often the little things that count in direct mail. For example, when you use the prospects' name in your mailings it can bring in five times more leads than when you do not. Another VERY IMPORTANT *little* thing is the spelling of the persons' name. SPELL IT RIGHT. If you don't you will offend the prospect. All he or she will see is his or her name spelled wrong. Your message, as wonderful as it may be, will be lost. I got a letter the other day to Mr. Suzanne K. Hutchinson, Jr. Needless to say I was not overly impressed! On the reply card ask the prospect to correct any misspelling of his or her name or address. This will offset some of the pain of seeing the name misspelled. Your letter has all of three to five seconds to make the prospect decide whether or not to read it. If he or she decides to open it at all it has twenty seconds to convince her it's worth reading at all. Then there are a few seconds of brain processing. The decision is made to throw the letter away, file it in a drawer or take instant action on it. By the way, if they file it in a drawer, the chances of them ever acting on it are so low as to be almost non-existent. So your direct mail package must be good enough, interesting enough, enticing and well written enough to cause a good percentage of your prospects to send in the reply card. When you see a one-page letter with three or four paragraphs you may say, "How hard could it be to write this"? Ah ... how hard indeed! While the letter is short and sounds simple it takes just the right amount of sales psychology to convert the letter into a lead. It is more difficult to say a great deal in a few paragraphs than to say a great deal in many paragraphs. Writing a good sales letter is not easy. It is not for the faint hearted. Not everyone can do it. So there you have it ... some tips to improve the odds of your direct mail getting read and those business reply cards getting sent back to you. No, a successful direct mail campaign is not a matter of simply buying a mailing list and mailing out a bunch of letters. It's much more than that. You can be successful at it if you'll take the time to learn how to do it correctly. Once you know the secrets of the trade you can turn ALL of your mailings into lead-getting adventures that will make you lots of money. © Copyright 2001 by Susanna K. Hutcheson and Powerwriting.com LLC. Any republication in any manner is prohibited without the consent of Powerwriting.com LLC or the author. We do give you limited permission to use this article on your Web site or in your newsletter if you print it or reproduce it exactly as it appears here including this notice. This article can not be sold by you or published in a for-profit publication. Rights to use this article may be purchased from us. Call us at 316-684-0457.
from Web site content to direct mail and radio spots. Visit her Web site at http://www.powerwriting.com. Her email address is powerwriter@powerwriting.com. Telephone: (316) 684-0457. Sales Pro Magazine - A free site with great content for sales people. Street & Smith’s Sports Business Journal - Informative Web Site on the business of sports. Bartlett - Familiar Quotations. Find quotations instantly, a great resource! Heart Profiler - American Heart Association’s interactive tool that provides personalized treatment options and questions to ask your doctor. Knowthis.com - Many marketing topics and information can be found here. Calorie Calculator - An extensive calorie calculator & diet related topics from Wake Forrest Univ. This month I am making a departure from our regular newsletter content and I am going to try to help a friend - Jack Bax. Jack is an extraordinary person, personally rescuing abandoned dogs and cats and bringing these wonderful animals into his home. Jack will often nurse animals back to health and spend his own money when a Veterinarian is needed. 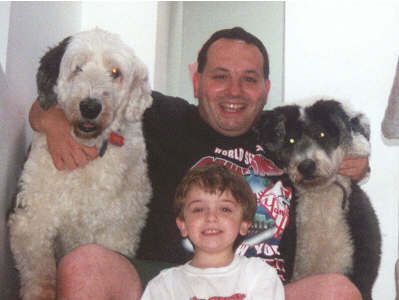 I met Jack almost ten years ago when a mutual friend told me that Jack had rescued a young Old English Sheepdog. Having just purchased “Beau” a puppy of the same breed, I thought a second dog would provide companionship when my wife and I were not home. It’s almost ten years since I adopted “Snoopy” and I am happy to report that I still have both dogs. Snoopy is the most wonderful, loyal dog I have ever owned and has brought tremendous pleasure to my entire family. Left picture: Snoopy, Michael and Matthew Borkan and Beau. 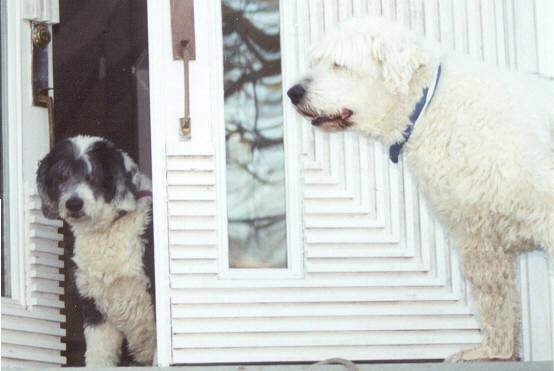 Right picture: Beau and Snoopy guard the house ready to lick any visitor! 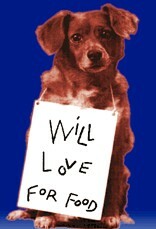 Jack recently asked if I knew anyone who would be interested in adopting the dogs or cats he has rescued. I immediately thought of this newsletter as an opportunity to help. Please contact me if you are interested and I will put you in contact with Jack. I can be reached at 631-667-5500 x 303.